Tourmalines name comes from the Sinhalese word for turmali, which means “mixed.” Occurring in more colors or combinations of colors than any other gemstone variety found in nature, this gem lives up to its name. Perhaps this is why ancient mystics believed tourmaline could encourage artistic intuition: it has the palette to express every mood. Dark blue, blue-green, an green tourmalines are occasionally heated to lighten their color. Red tourmalines, also known as rubellites, and pink varieties are sometimes heated or irradiated to improve their colors. Heat and irradiation color enhancement of tourmalines is permanent. 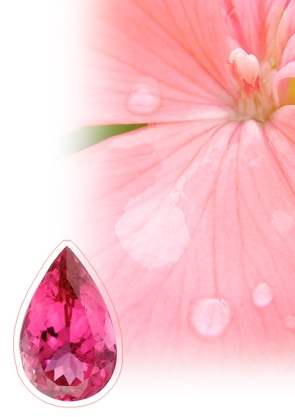 The pink tourmaline is the birthstone for the month of October. Occasionally, some tourmalines may have surface-breaking fissures that are filled with resins, with or without hardeners. Care must be observed with these gems. Avoid exposing them to harsh abrasives and strong chemical solvents.